Disney Rose Parade 2000 - Roy and Sorcerer Mickey . This was issued to celebrate the tournament of roses parade 2000 grand marshal, Roy E. Disney. It is a beautiful cloisonne, with exceptional detail. It features Mickey Mouse as the sorcerer's apprentice, and it even has an image of Roy Disney in porcelain! Approximately 2000 were released for sale. 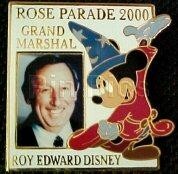 The pin reads Rose Parade 2000 - Grand Marshal - Roy Edward Disney. The release of the pin coincides with the release of the new Disney film Fantasia 2000 that was released to the public on January 1, 2000. This pin measures 1 3/8" tall by 1 3/8" wide.